Time .. always changing things .. Some thoughts based on my recent presentation to the INFODAYS14 conference held at Charles University, Prague, Czech Republic 5-7th November 2014. The future of library and information science (LIS), is inextricably linked to the future of the document. Leaving aside for the moment, the question of exactly “what is a document?” this comes as no surprise to those of us working in this area, as we know that civilization owes its existence to recorded knowledge. For the time being also, let us allow ourselves to consider knowledge and information to be interchangeable terms, and within our LIS discipline, we will assume that for the purposes of communication, such knowledge or information must be instantiated as a document of some kind. We can further understand that documents contain, and therefore allow access to, ‘formal’ information – i.e. something that is published, and therefore subject to the processes of the information communication chain, [Popper’s World III, instantiated in World I, physical objects]. This is in contrast to ‘informal’ information, which remains inside someone’s head – although developments in telepathic communication are starting to enter the research literature, we are still some way away from being able to intercept and understanding the thought processes of another being, [Popper’s World II]. I am often called on to comment on the nature of library and information science. To reiterate, here at City University London, we consider the discipline of library and information science to be the study of documents, on their journey through the information communication chain. The realm of library and information science then, is the realm of the document. We, as researchers and practitioners within this field, are concerned with the activities surrounding the creation, dissemination, management, organisation and retrieval, and use of documents. We study these processes of documentation through the lens of Hjørland’s concept of domain analysis, invoking study and praxis within facets such as knowledge organisation, information retrieval, document preservation, historical studies, and research into information behaviour. The changes in this chain of events, are driven largely by technology, although factors such as economics, politics and social tastes are all able to impact on the business of recorded knowledge. Let us take a look at some of the developments that can be seen to be influencing the nature and definition of documents, as 2014 draws to a close. A quick scan of the literature on the definition of information, reveals the troubled history of the concept central to our discipline. To-date, there is no single, satisfactory explanation of what information actually is. There are many attempts at definition, and indeed theories, both within the field of LIS and within other, seemingly unrelated disciplines. Resurgence in interest in information communications theory, can be seen to have heralded interest in information physics, philosophy of information and information biology. To some, the concept of information in these fields remains unconnected to the social discipline of library and information science, but to others, there is an interest in looking for connections and a possible theory of unification. See Bawden and Robinson papers below, for further reading in this latter area. The jump to prominence of data science and related areas (big data, data analytics, data visualisation) can be seen in the number of recent university courses being introduced (we have introduced one this year at City University), and reflected in the required skills listed in many job advertisements. One of the top skills sets required by employers across the sectors is the ability to collect, analyse and interpret data. Data handling and communication are now sitting alongside the more traditional ‘verbal and written communication skills’ that professional level work demands. These skills are becoming essential to practitioners within library and information science as e-science and the digital humanities pour more and more data sets into our sphere of influence. These digital data files are one example of the new forms of document that require the attention and understanding of members of our discipline. The move to open data, and the expectation that data will be published alongside findings are changing the way library and information professionals support scholarly communication. Indeed the move towards digital scholarship heralds a new era for partnerships between librarians and researchers. The mass digitization of literature, poetry, art and music has led to an increase in materials and methods available for humanities based studies. There is a movement towards situating digital humanities research within the library and information environment, which seems to many, to be its natural home. Again, as with e-science, the availability of large data sets and multi-media files is fuelling new growth areas for understanding patterns and trends (text mining), and for facilitating the final convergence of the GLAM sector, where digital renderings of text, image, sounds or even objects bring the previously separate collection disciplines into a melting pot of new services and interpretations. We are witnessing new roles redefining library and information science as a producer of new content, understanding and insight, supporter of new forms of scholarship, and a leader in scholarly communications. Library and information science has always had an intimate relationship with the processes of publishing and dissemination. Changes in both scholarly and trade publishing are well documented, driven by the open access movement and the demand for new models of consumption respectively. The rapid growth of mobile devices and social media has revolutionised what it means to be an author and what it means to be a disseminator or a reader. It is probably fair to say that anyone with access to technology (not everyone) can be both an author and a publisher. New mechanisms for content creation (image/media capture devices, writing for transmedia) allow new forms of documents (interactive narratives) to flourish, and we are seeing a move towards content marketing, an increase in the use of images or video over text, and in data mashups. New tools to help us understand the reach and potential impact of new publishing formats, referred to as altmetrics, are entering the armoury of library and information science alongside existing bibliometric and informetric analyses. What it means to publish is changing alongside the development of the document. Technological advances undoubtedly drive the most significant changes in the form and nature of documents. I have written previously in this blog, that developments in pervasive computing, multisensory network technologies and participatory human computer interfaces will allow new forms of documents to emerge, specifically ‘immersive’ documents, where unreality can be perceived as reality. News of current developments in virtual reality headsets and roomscape projection abounds, and consumer versions of games, narratives and training scenarios appear to be just around the corner timewise, rather than siting themselves somewhere in the mid to long term future. Before we arrive at the availability of completely immersive documents, we will see a range of lesser, participatory experiences, such as the interactive, transmedia narratives mentioned in the previous section. In these narratives, the story reaches out beyond the imaginary world, into the reality of the reader, with texts, phone calls and connections, seemingly coming from characters within the plot. The way the narrative plays out can be influenced by the reader, as can the ending. The blurring of boundaries between a game, a learning experience or pure fiction with this type of document is evident. There will also be ethical implications with regard to how these documents are used. As documents evolve, so then will the scope and processes of what we understand as library and information science. New forms of document will require extensions and adaptations to our current tools for knowledge organisation, new information architectures and new understandings of human information behaviours. Most interestingly perhaps, for the LIS profession, will be the need to engage with and promote ‘immersive literacy’, possibly in a similar way to which Gilster suggested for digital literacy less than two decades ago. Gilster P (1997). Digital Literacy. New York NY: Wiley, New York. Hjørland B (2002). Domain Analysis in Information Science: Eleven approaches – traditional as well as innovative. Journal of Documentation, vol 58(4), 422-462. Robinson L (2009). Information Science: the communication chain and domain analysis. Journal of Documentation, vol 65(4), 578-591. Robinson L and Bawden D (2013). Mind the gap: transitions between concepts of information in varied domains. In: Theories of information, communication and knowledge. A multidisciplinary approach. Eds. Ibekwe-SanJuan F and Dousa T. Springer. Robinson L (2014a). Multisensory, Pervasive, Immersive: towards a new generation of documents. Journal of the Association for Information Science and Technology, in press. Robinson L (2014b). Immersive information behaviour; using the documents of the future. New Library World, in press. 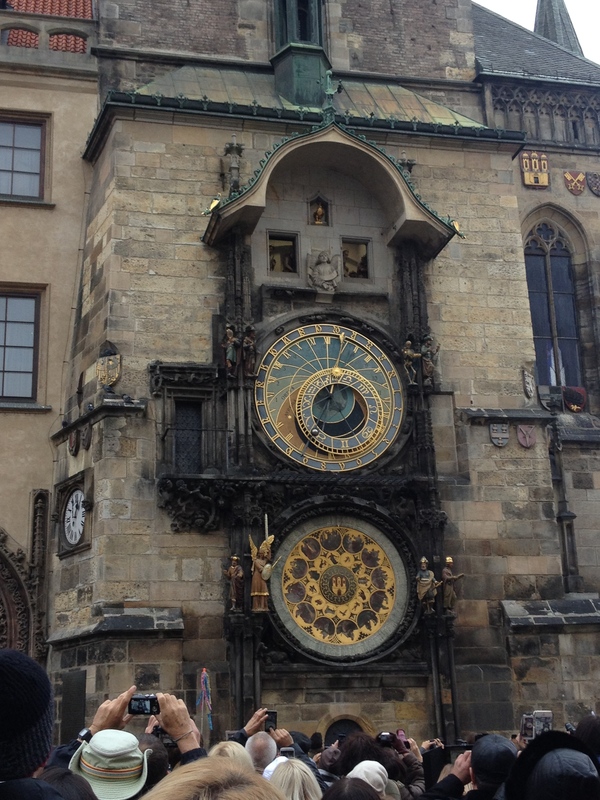 This entry was posted in Research and tagged Charles University, digital-humanities, documents, immersive, INFODAYS14, information-theory, LIS, lis-education, Prague, presentation, publishing by Dr Lyn Robinson. Bookmark the permalink.